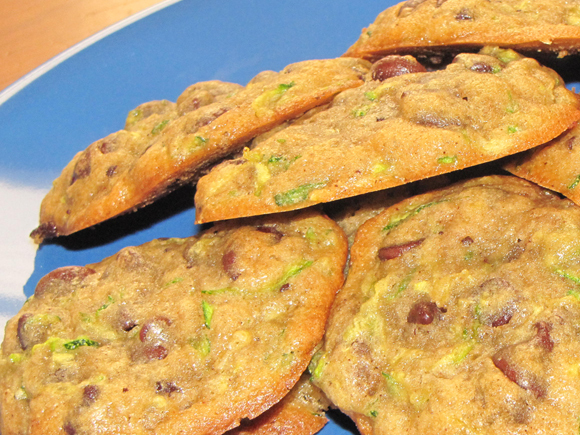 This twist to the old fashioned chocolate chip cookie is sure to become of favorite. You can't go wrong with these super quick, super easy, super tasty treats that get veggies into your kids without them even knowing it! I used a tub of pre-made dough, but you can make the dough from scratch if you'd prefer. To be perfectly honest, if I didn't already have a bunch of pre-made, ready-to-go chocolate chip cookie dough, I definitely would have made my own cookie dough. Nothing beats getting out the mixer and getting flour all over the table! For those times when I'm craving a sweet treat (or my son is asking for cookies) and I don't have the time or energy to whip up some dough though, the pre-made stuff works just as well. P.S. My decision to use the pre-made stuff may have been slightly skewed by my beloved Costco having a coupon for the big tub of chocolate chip cookie dough. 2. Mix dough, zucchini and cinnamon together well. 3. Allow to chill for about 30 - 60 minutes in refrigerator. 4. Cook according to dough directions.